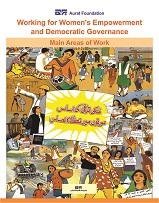 Established in 1986, as a national, non-profit, non-governmental organization under the Societies' Registration Act 1860, Aurat Publication and Information Service Foundation (Aurat Foundation/AF) is committed to create widespread awareness and commitment for a just, democratic and caring society in Pakistan, where women and men are recognised as equals, with the right to lead their lives with self-respect and dignity. 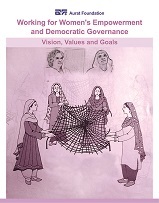 Over the last 28 years, Aurat Foundation has come to be recognised nationally and internationally as one of the leading institutions creating, facilitating and strengthening civil society groups and networks for promoting trust and collaboration among citizens to mobilize public pressure for women’s empowerment in the country. 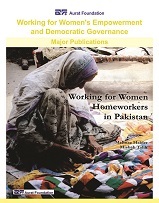 Aurat Foundation has its Head Office in Islamabad, and five regional offices in the provincial capitals in Lahore, Karachi, Peshawar ,Quetta and Gilgit, and 37 Field Offices. Further, it has a countrywide network of voluntary citizens' groups and individual activists in 128 districts in the country. 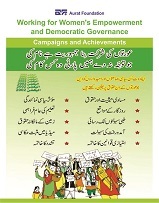 These groups include Citizens Action Committees (CACs), Resource Groups and Aurat Foundation Resource Centres (AF-RCs) and Information Network Centres (INCs). The Foundation has also emerged as a major support institution for civil society organisations working for social change at the community level. 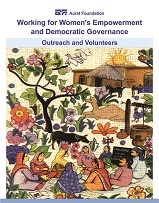 To facilitate citizens’ active participation in the process of social change and governance at all level.